Corner Shelving, puts that unused corner space to work, creating additional storage. 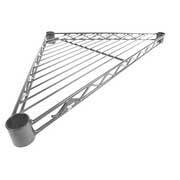 Corner wire shelves are very versatile and can be used in homes, offices and businesses. * Please note, we can cut post to any size just add $8.50 per post to pricing for Corner Shelf Posts.